Quote, "Gov. Scott Issues Emergency Order for Red Tide On August 13, 2018, in News Releases, by Staff? Is it just me or do you find this a play on words? "WORD MAJIC"
Pg. 1: It is only mentioning "Red Tide Algae Bloom"
What about the Blue Green Algae? Red tide is a naturally-occuring microscopic alga? Produce proof. Red Tide documented as far back as 1840? Produce proof. 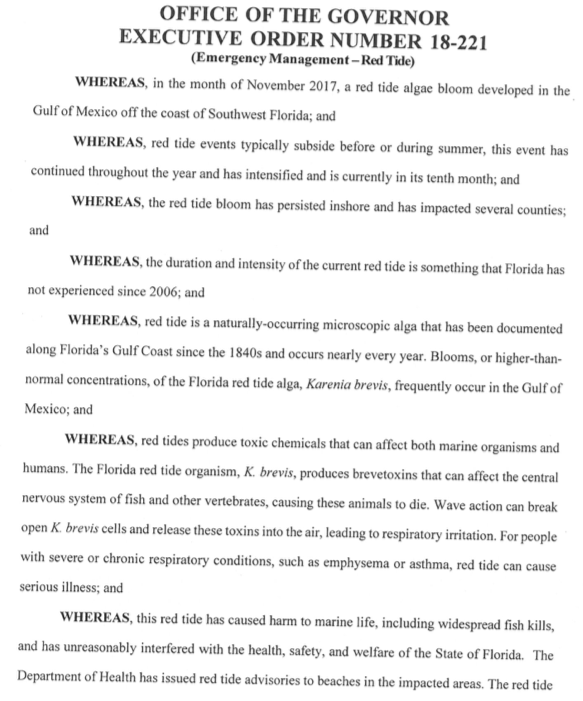 Section 1, Because of the foregoing conditions and on-going threat of red tide, I declare that a state of emergency exists in Pinellas, Hillsborough, Manatee, Sarasota, Charlotte, Lee, and Collier counties. I designate the Director of the Division of Emergency Management as teh State Coordinating Officer for th eduration of this emergency and direct him to execute the State's Comprehensive Emergency Management Plan and othe rresponse, recovery, and mitigation plans necessary to cope with this emergency. 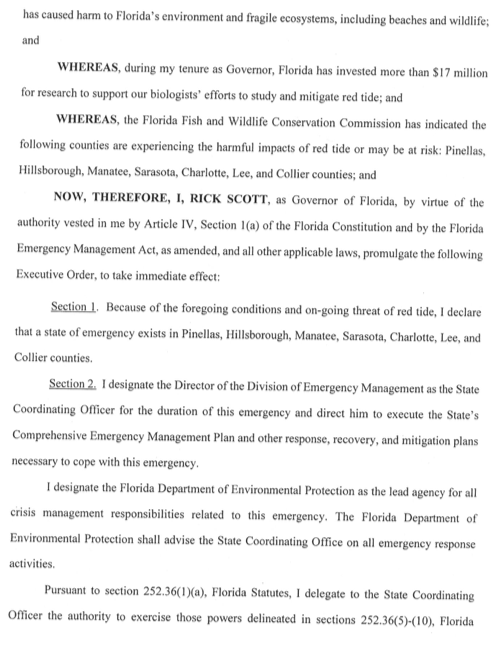 I designate the Florida Department of Environmental Protection as the lead agency for all crisis management responsibilities related to this emergency. 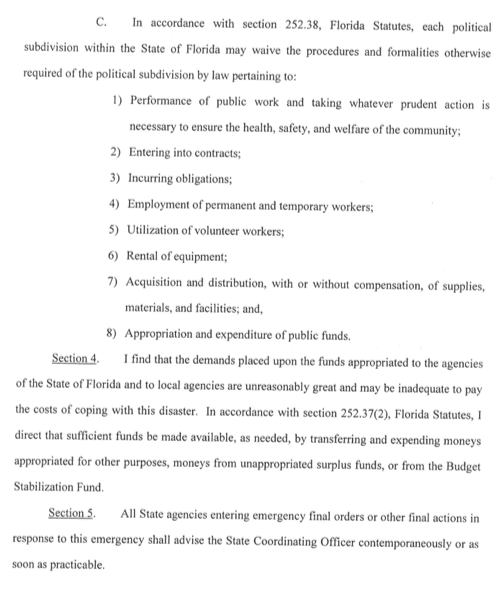 The Florida Department of Environmental Protection shall advise the State Coordinating Office on all emergency response activities. 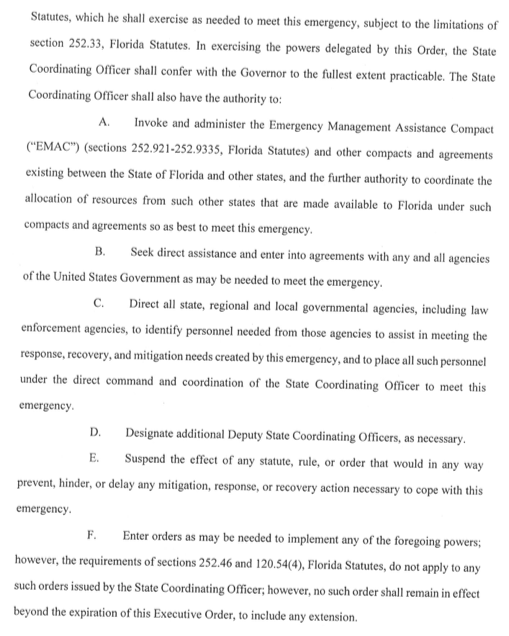 Invoke and administer teh Emergency Management Assistance Compact ("EMAC") (sections 252.921-252.9335, Florida Statutes) adn other compacts and agreements existing between the State of Florida and other states, and the further authority to coordinate teh allocation of resources from such other states that are made available to Florida under such compacts and agreements so as best to meet this emergency. Seek direct assistance and enter into agreements with any and all agencies of the United States Government as may be needed to meet the emergency. Direct all state, regional and local governmental agencies, including law enforcement agencies, to identify personnel needed from those agencies to assist in meeting the response, recovery, and mitigation needs creted by this emergency, and to place all such personnel under the direct command and coordination of the State Coordinating Officer to meet this emergency. Designate additional Deputy State Coordinating Officers, as necessary. Suspend the effect of any statute, rule, or order that would in any way prevent, hinder, or delay any mitigation, response, or recovery action necessary to cope with this emergency. 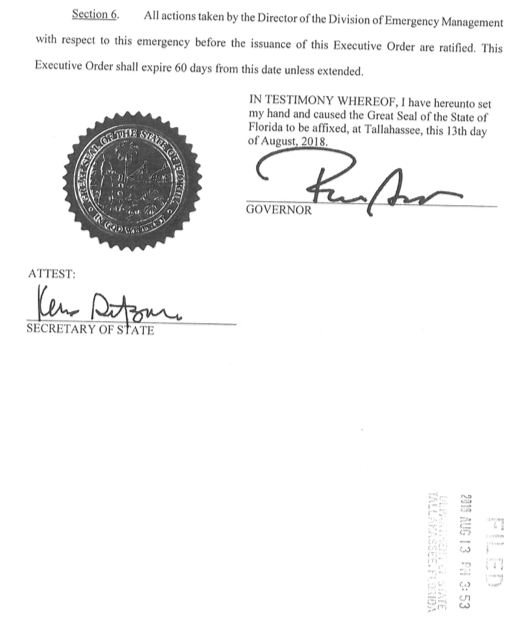 Enter orders as may be needed to implement any of the foregoing powers; however, the requirements of sections 252.46 and 120.54(4), Florida Statutes, do not apply to any such orders issued byt he State Coordinating Officer; however, no such order shall remain in effect beyond the expiration of this Executive Order, in include any extention.